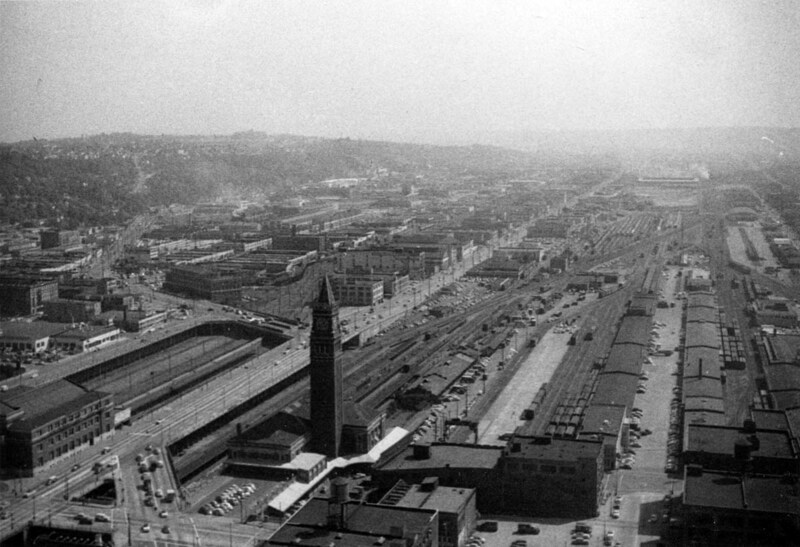 The photo was taken from Seattle's Smith Tower in late summer 1954. For a larger version, click here. Union Station (Union Pacific and Milwaukee Road). Union Station tracks - the train in the station is most likely the UP Portland-Seattle pool train. This area is now filled with office buildings. Intersection of 2nd Avenue South, 4th Avenue South and Jackson Street. 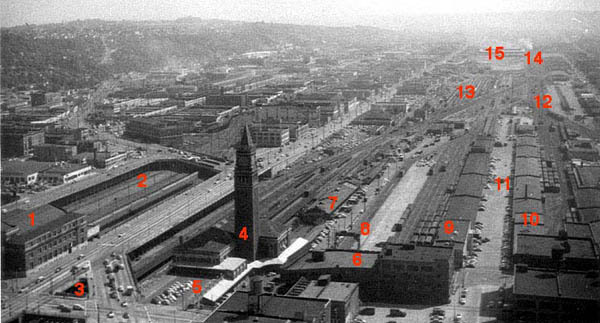 King Street Station (Great Northern and Northern Pacific). King Street Station upper parking lot. Old Post Office Terminal Annex building. GN team tracks - the GN Hustle Muscle SD45 was on display here in 1966. Future site of Kingdome and then Seahawk Stadium (Seattle Seahawks). Future site of Safeco Field (Seattle Mariners). Mainline to Tacoma and Portland. New Post Office Terminal Annex in distance.